For this writer, one of the greatest rewards of off-beat travel is to discover that, no matter what those guide books or the media might have led you to expect, nothing is really what it first appears to be. And nowhere is this more true than in Madagascar. This amazing island in the Indian ocean, only a few hundred miles east of the African continent, is indeed a place where, in many ways, time has stood still. Here, you’ll see flora and fauna found nowhere else on the planet: not only Madagascar’s celebrated lemurs and its incredible variety of birds (of which 57 percent are endemic), but also a seemingly endless variety of chameleons, frogs, turtles, bats, snakes (all of them non-venomous, you’ll be glad to know) and countless other fascinating creatures. And that’s not including plants or insects. Not surprisingly, Madagascar has long been a prime destination for scientists pursuing their quest to unravel the mysteries of evolution. And then there are Madagascar’s human inhabitants, in many ways no less unique than their environment. Despite the island’s proximity to Africa, most Malagasy people trace their origins in the opposite direction, to India, Malaysia, even Indonesia. To complicate matters even further, throw in a mix of Portuguese explorers, ruthless pirates, British warships, French colonists, and zealous missionaries, and you begin to get the picture. But even then, you can’t be sure that you have the whole picture. Malagasy culture still retains its own aura of mystery. It’s also a country of paradoxes, with an abysmal gap between rich and poor. Approximately seventy percent of Madagascar’s population of about 21 million struggle to earn between one and two US dollars per day. While the government, along with the United Nations, the World Wildlife Fund, and other groups have made significant progress in reducing poverty, there’s still a long way to go. This is due, in part, to a complex relationship between identity, ancient tribal traditions, education, and economic opportunities. While a handful of urban elite drive luxurious cars, speak fluent French, and send their children to the prestigious *Ecole *Polytechnique in Paris, villagers in some rural areas still practice the ancient rite of *famadihana (literally translated as Turning of the Bones), in which a dead family member is exhumed, wrapped in new shrouds, then photographed next to living descendants before reburial. Then there’s the language. 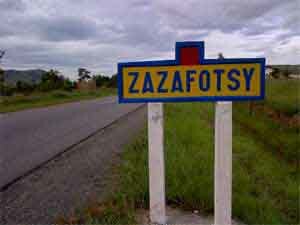 For foreigners, the standing joke is that learning to speak Malagasy would be easier if one were born with a stutter. *Antananarivo, *Betsimisilaka,*Ambomdrona, *Zazafotsy, *Ambodifotatra, *Fiarantsoa-these are just a few out of hundreds of tongue-twisters. As for the country itself, I’ve seldom experienced such magnificent and varied scenery: majestic *baobab trees, pristine rain forests, waterfalls, rugged mountains, verdant valleys, and seemingly endless stretches of rice paddies. There are now more than fourteen national parks (whose entrance fees, by the way, help to support their adjacent communities). One of them, Isalo, could be a set for a classic western movie, while, on some of the outlying islands, you might well imagine yourself in Anguilla or Barbuda. But for me personally, one memory of my visit stands out above all others. Late one afternoon, Albain, my driver/guide, decided to pull over into a scenic lookout from where we could view a magnificent waterfall. (He had learned by now that I was an avid photographer). But then, just as I was squinting into the camera’s viewfinder, I felt a tug on my sleeve. As if out of nowhere, two young children, a boy and a girl, had materialized soundlessly from the adjacent trees. When I looked at the baskets they were carrying, I realized that they were selling wild mushrooms. Meanwhile, other people were emerging from the forest, until I had a group of at least a dozen around me. And all were trying to sell me what was obviously the region’s local delicacy. “What should I do?” I asked Albain. “I hate to disappoint them, but there’s no way I can buy all those mushrooms”. “Take their picture”, he suggested. “Quite sure, *Monsieur. Anyway, they don’t really expect a foreigner to buy anything like that. They just want to see themselves in the picture”. Afterwards, everyone lined up in an orderly fashion and, one by one, took turns to peer at the image I’d captured. The children smiled and nodded approvingly, while the adults shook my hand and wished me *bon *voyage. Amazingly, not a single person, not even the children, would accept any money. My last impression was a sea of waving hands as we drove off. It was then that I realized that I’d finally captured the real essence of Madagascar: its wonderful people. Travel tips: in my opinion, the best way to explore Madagascar is to hire the services of a driver/guide-not nearly as expensive as you might think. Accommodations are also extremely reasonable, varying from rustic log cabins, often in breathtaking settings, to four star hotels. One word of warning: don’t forget your anti-malarial shots!